Sector is engrossing, beautiful, wild and a fine addition to the iPad music studio. IAA/AudioBus support. Engrossing. Good fun. Lacks built-in effects. No audition during playback. 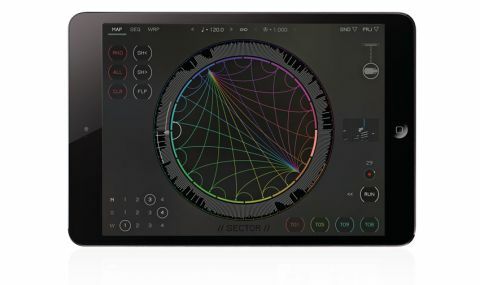 Kymatica's "stochastic sample slice sequencer" could well be the most sci-fi-appearing iPad music app yet, with its spikily animated central interface and minimalist design. "There's a controlled element of chance to the triggering and processing of sectors"
At its core, it's a sample slicer and sequencer, enabling an imported audio loop (or one of the sizeable roster of included ones) to be sliced into anywhere between 2 and 32 "sectors". But what makes it different is the "stochastic" bit, which brings a controlled element of chance to the triggering and processing of sectors. In the first of its three screens (MAP), a Markov-chain (Google it!) determines the order of sector playback. Each sector can be connected to any number of other sectors, and which one plays next from that selection is down to user-defined probability distribution. However, the "Markov-chain matrix" can be overriden using the 64-step sequencer in the SEQ screen. Again, each step has a user-defined chance of triggering its assigned sector, so you could use it to, say, simply fire off a kick drum at the start of every otherwise-chaotic bar, or throw in a scattering of sonic 'anchors' of varying likelihood throughout a longer phrase. The final screen, WRP (Warp), lets you assign up to four playback shapes from an extensive list of possibilities (all reversible, too), each, once again, with its own percentage chance of being applied when triggered. These cover all manner of sweeps, glitches, scratches and bends and are enormous fun to play with. Always visible, no matter which screen you're in, are a set of memory slots for the MAP, SEQ and WRP configurations, four assignable sector trigger buttons, and a nifty little display that visualises the overall recent playback pattern. With Inter-App Audio and AudioBus support in place, Sector works well with other apps - a good thing, too, given its surprising lack of built- in effects. The inability to audition sectors during playback is also a bugbear. Other than that, though, Sector is engrossing, beautiful, wild and a fine addition to the iPad music studio.